Scott Bennie is a friend of mine, who I’ve seen far too little of in recent years. He’s also a veteran writer and designer in the tabletop RPG and computer game industries, one of the very best of us in terms of both talent and character. This week, I want to celebrate just a handful of his many great products, and introduce you all to a human being who made our hobby better in so many ways. Scott had a hand in a whole slew of D&D products in the 80s and early 90s, including the (in)famous* Castle Greyhawk. His work on this product is part of what established him as a fun-loving creator and much sought-after freelancer. (*) – Played for laughs throughout, many thought this product was meant to “spite” Gary Gygax’s original creation. However, the interest in playing up the “fun factor” of dungeon delving, puntastic riddles, and odd puzzle solving was the goal of this all-star cast of creators. Castle Greyhawkcontains 13 detailed levels for adventuring and exploration. Each is a separate adventure written by different author and each has its own unique brand of baffling weirdness. Some levels involve solving puzzles and some require good old hacking and slashing. The adventure can be played separately or all together as a grand quest to free Castle Greyhawk from the evil, rotten hordes that are plaguing it. The common theme of this dungeon is that no joke is so old, no pun so bad, and no schtick so obvious that it can’t be used to confuse and trip up PCs! An Adventure Anthology. Though Castle Greyhawk presents a single dungeon, it’s actually an adventure anthology, with each level written by a different designer. The first D&D adventure of this sort was B9: “Castle Caldwell and Beyond” (1985), but it was a singular experiment at the time. For some reason, TSR suddenly became very fond of anthologies in 1988, with other releases including DL15: “Mists of Krynn” (1988) and OP1: Tales of the Outer Planes (1988). Not Expanding Greyhawk. Gary Gygax may have created the Castle Greyhawk dungeons as early as 1972. He promised publication as early as 1980, but only got as far as publishing adventures based on “demiplanes” that were connected to Castle Greyhawk. In the end, there were three: EX1: “Dungeonland” (1983), EX2: “The Land Beyond the Magic Mirror” (1983), and WG6: “Isle of the Ape” (1985). Parody & Humor. 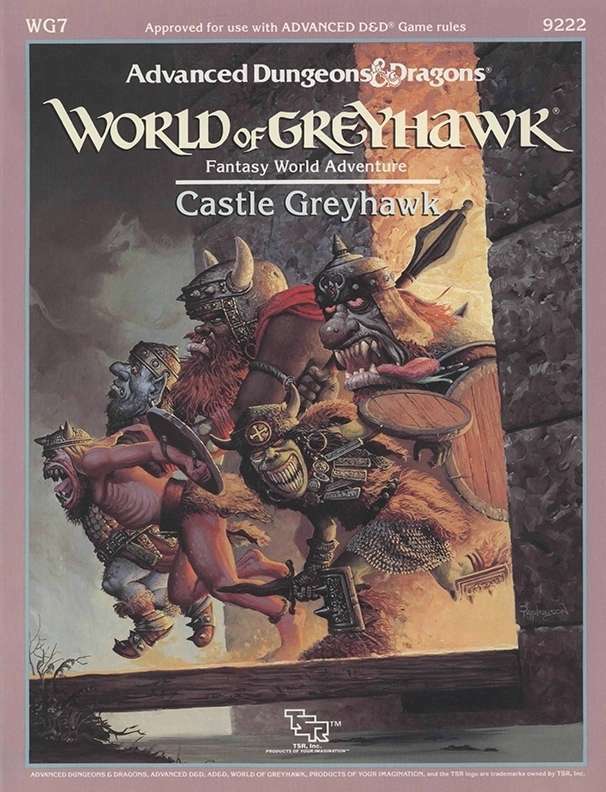 Though it wasn’t the original Castle Greyhawk, this Castle Greyhawk was enjoyed by some for its parody and its humor, which included references to Star Trek, the Marvel Heroes, the Three Stooges and much more. Some parodies and other D&D humor had appeared in April issues of Dragon previously, but as a fairly humorous supplement, Castle Greyhawk was pretty unprecedented.